Play with the sounds of vine and wine! 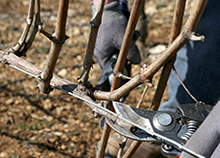 Pruning must be carried out every year during winter, which curbs the vine’s naturally vigorous growth. Once pruned, the vine is ready for the arrival of spring. This task sets the tone for the vintage to come, since it involves selecting the canes that will provide the future fruit-bearing shoots. Working the soil is a crucial task to enrich and aerate it. 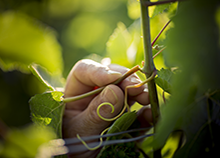 There are two main tasks: Earthing up around the vines to protect them against frost during winter, and deep plowing, which is done after old vines have been removed and before replanting. 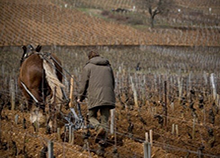 In the Bourgogne wine region, more and more winemakers are returning to the use of horses to work the land. 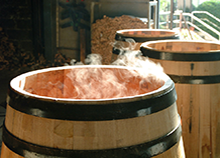 Toasting is one of the most important stages in barrel making. It consists of placing the half-finished barrel over a brazier, which produces steam in the oak, allowing the staves to be bent and thereby shaped into a barrel. But crucially, the degree of toasting also imparts flavors into the wood. This will be agreed between the cooper and the winemaker, since it will influence the character of the wine once aged. The toast will thus be varied according to the style of wine desired, but also depending on the vintage and the varietal involved. 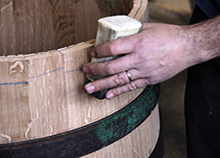 At the start of making a barrel, metal hoops are temporarily placed around the staves to hold them together. The hoops are manually fixed by the cooper with the help of a hammer. At the end of the production process, the temporary hoops are removed and replaced by galvanized steel hoops, which ensure the barrel stays watertight. Sorting in the winery offers a second opportunity to reject second-rate or diseased fruit, after the preliminary sorting done in the vineyard at harvest. Sorting in the winery is not always necessary, notably in very good years when the grapes are in tip-top condition. Sorting is carried out when the freshly picked grapes arrive in the winery, and is the last stage before vinification proper begins. The fruit is tipped onto a conveyor, and the sorters remove any unwanted material such as leaves, damaged grapes, or bunches that are not fully ripe. At the end of ageing, either in barrels or vats, the winemaker will taste the wine and decide on the best moment for the last stage; bottling. 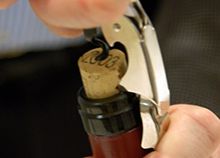 The date of bottling depends on the type of wine produced and the choice of cork to be used. 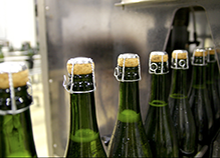 During bottling, the wine is pumped into a vat and the bottles are filled and corks inserted by special machines. There is a sound that promises a shared pleasure to come! A Bourgogne wine is first tasted by the ear, since the sound of a cork being pulled prepares our other senses for a tempting aromatic journey. If you want to know the ideal moment to uncork your Bourgogne wine, check out our search engine, which will give you an estimate of when to drink your wine at its best depending on the appellation and the vintage. When you serve a Bourgogne wine, you need to respect certain conditions so it can be fully appreciated. The right temperature, the right choice of glass, and when appropriate the use of a decanter all contribute to a successful tasting experience. Depending on the weather conditions, the winemaker may decide to remove the leaves growing at the height of the bunches during the summer, so the grapes can benefit from more exposure to the sun. If practiced, the leaves are only removed on the side of the row that gets the rising sun. This technique helps improve ripeness and aerates the bunches. It also facilitates harvesting by hand. 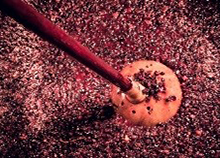 Pushing down the cap is a very old practice in the Bourgogne wine region, which involves forcing down the wad of solid grape matter that floats on top of a vat of red wine, known as marc, back down into the juice below. This can be done manually using a pole with a disc on the end, or mechanically. It is carried out in the early stages of fermentation for reds and improves maceration and extraction of tannins, aromas, and the color compounds contained in the grape skins. 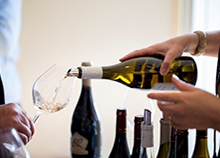 Bourgogne wines can also be tasted using hearing! Exercise your ears through a fun and educational quiz, which will allow you to discover another side of Bourgogne wines. You have managed to associate all the sounds with the right images. If you wish to keep playing with Bourgogne wines, discover the quiz "Which is the Bourgogne wine for me. Your browser does not support tag .